As I post this now, it's 8:30 am in Beijing. Tonight the Opening Ceremonies begin, and I suppose that everything is going to change around here. 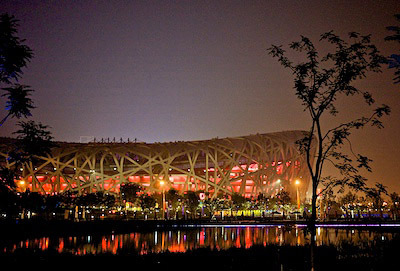 I captured this image of the Bird's Nest Stadium last night while walking in Beijing. It was one of those magical moments in the city when we were all out strolling along the perimeter of Olympic Village. 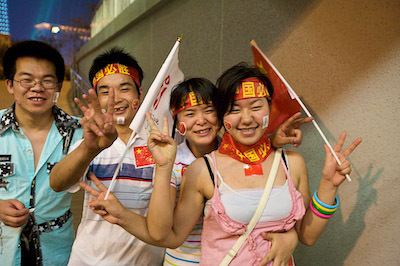 People were waving little flags, taking pictures, and enjoying being out en masse with their friends and family. We were about the only Americans I saw on this walk, which made it even more enjoyable. I felt like I was immersed in what it feels like the moment before the world comes to your doorstep. More to report soon. Photos by Derrick Story, captured with a Canon 5D and 16-35mm L II lens. ISO 1600.